COMMUTERS IN DUBLIN are paying a premium of 15%, or over €60,000 extra, for houses that are located within 1km of a Luas stop, according to a new Daft.ie report. This means that buyers are now paying an average of €446,000 for a property close to a Luas stop, which is €61,000 more than the average asking price in Dublin. The research released today analyses the average asking prices for two and three bedroom properties close to each of the 67 Luas stops in the Greater Dublin Area between July 2017 and June 2018. 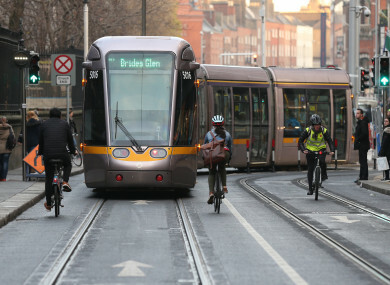 It found that properties on the Luas Green Line command the highest prices of any Luas properties, with average prices of €524,000 or €139,000 more than the Dublin average. On the southside of the city, the contrast is even greater – averaging a difference of €172,000 between Dublin in general and properties close to the southside Luas Green Line. On the Red Line, property values average at €378,000, which is €7,000 cheaper than the Dublin average of €385,000. Beechwood has been found to be the most expensive Luas stop to live beside, with average asking prices of €778,000. The least expensive Luas stop to live beside is Cheeverstown, with average asking prices of €197,000 for two and three bedroom properties within a kilometre of the stop. Commenting on the figures, Martin Clancy from Daft.ie said: “Access to transport infrastructure is unsurprisingly driving up premiums for properties with good connectivity. “For example, on the Luas Green Line, 24 of the 35 stops have average property prices of more than half a million euro. The full Daft.ie report can be read here. Email “People are paying an extra €61,000 to live near a Luas stop”. Feedback on “People are paying an extra €61,000 to live near a Luas stop”.